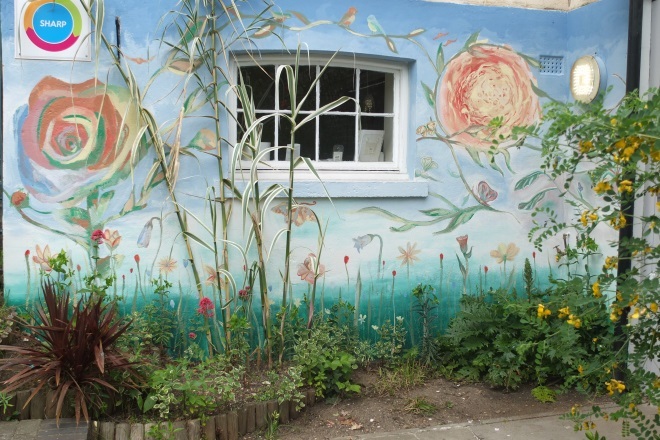 Discussion over having a mural at the SHARP team have been in the pipe line for some time and as the weather brightened, the paints were ordered we began to plan a design to bring to life the wall outside the building and welcome visitors to the SHARP team. Anna-Maria and Natasha put together various preliminary sketches and collages and ambitious thoughts before they came up with a final plan. Flowers, butterflies, birds and a sun spread across the wall over the course of the next few weeks. Natasha used inspiration from the David Bowie flower and was inspired by what the sun looks like up close with her incredible fireball brightening the scene. Using an old botanical drawing book Anna-Maria brought in small flowers springing from the real life flower bed and dragonflies and butterflies and birds have been ornately spread across the scene. Challenges revealed themselves, such as working in the heat and avoiding the rain to harmonising the two different styles. 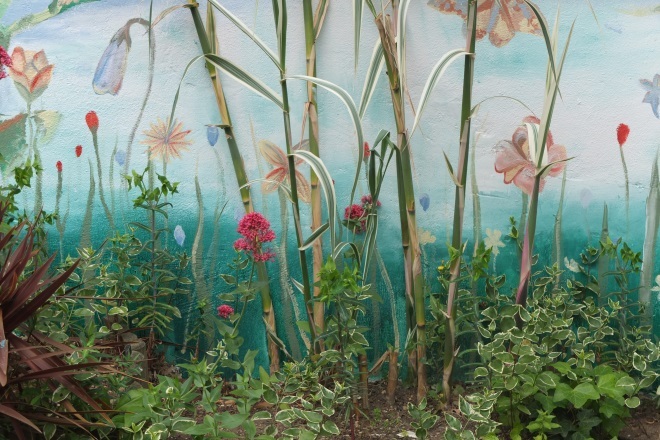 The wild garden has been an inspiration not only for the mural but our wild garden show which is displaying artworks by 12 artists inspired by the garden. We held the mosaic portrait drawing workshop in the garden run by Natasha. These works are exhibited in the show.